Built by a musician for musicians, Beater is a full-featured and ad-free compact digital metronome, containing all the features you need on a single screen and priced for the musician's budget. 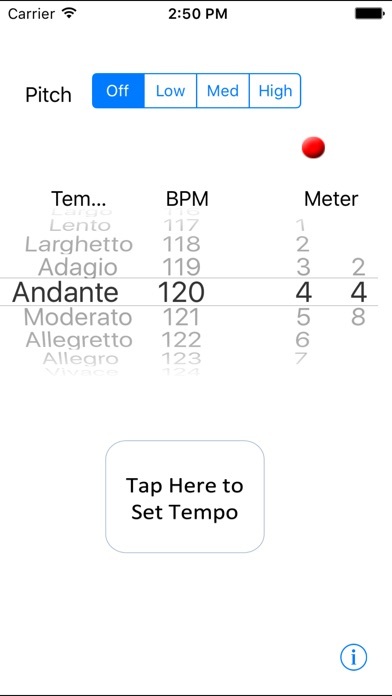 With Beater, you can set the tempo by dialing up a tempo name or a specific beats per minute number. Or you can simply tap the screen at the pace you want to set the desired tempo. You can select from a wide range of meters. With sound turned on (use your phone's volume controls), Beater will sound each beat and will accent the first beat of every measure. With sound on or off, Beater shows a visual indication of tempo and so it can be used in "stealth" mode in group settings without making a sound. The current version of Beater replaces the use of a system timer as the beat source that is used in many other metronomes. The beat source for Beater is the highly accurate processor clock, monitored in its own thread. The result is a steadier beat than you'll find in many other phone-based tuners. I wrote Beater for my own use and I use it all the time. Support for a wider range of tempos (20-260) than many other metronomes. "Keep-awake" mode that prevents your phone from shutting down when Beater is running. A complete list of common meters, including 5/4 and 7/4 time. Tempo setting by dialing or tapping. An audible beat that accents the first beat of every measure. A visual indicator of tempo whether sound is on or off.